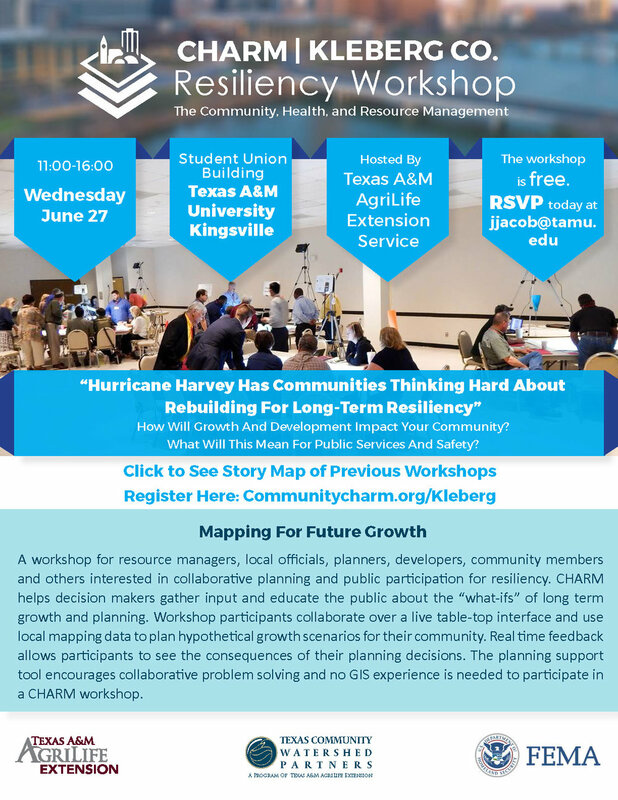 CHARM RESILIENCY WORKSHOP | KLEBERG CO.
CHARM– a tool for Kleberg CO. – participatory planning for everyone, experts and non-experts alike. Intro to CHARM: Planning for Resilience- What are our choices? Interactive Exercises and Scenarios for Kleberg County –Where will all the people go? Exercise debrief: Comparing Scenarios- Common approaches and divergent views. Where should we encourage development? How many homes are vulnerable to flooding? Surges? How does this impact the water quality of our watershed? These are just a few of the many data layers we will have at the workshop. Click to see the campus map.